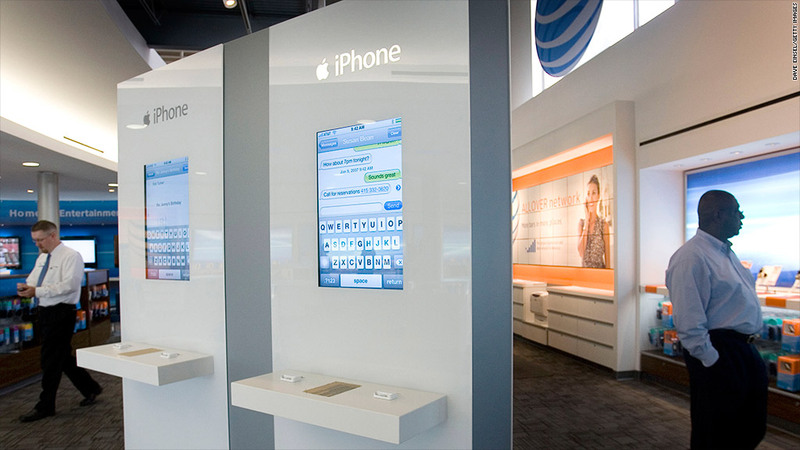 An iPhone display at an AT&T cellular store in Houston, Texas. AT&T announced record quarterly smartphone sales on Thursday. The company sold 10.2 million smartphones in the fourth quarter, which it said was the most ever for a U.S. carrier. Ma Bell activated a record 8.6 million iPhones, though AT&T said it also had its best-ever quarter for sales of Android phones. The news comes on a day when Apple shares sold off sharply, sinking 12% following the release of the company's quarterly results Wednesday afternoon. Apple (AAPL) reported a record quarter, boosted by strong iPhone and iPad sales, but the popularity of cheaper versions of its mobile devices pinched profits. AT&T's overall fourth-quarter smartphone sales topped the previous record of 9.4 million from the fourth quarter of 2011. Ironically, strong smartphone sales are bad for carriers' profit margins. A new phone you buy for $199 may cost your carrier two or three times as much when they buy it from the manufacturer. They pay a heavy upfront subsidy to get you hooked on a long-term contract. AT&T did not break down iPhone activations by model in its press release. But the company noted that its wireless operating margins took a hit in the fourth quarter, a possible sign that it sold a large number of newer iPhone 5s as well as older iPhone 4S and iPhone 4 models. AT&T rival Verizon (VZ) said Tuesday that it sold a record 6.2 million iPhones in the fourth quarter, making up two thirds of its total smartphone sales. Overall, AT&T (T) reported earnings per share, excluding special items, of 44 cents, on $32.6 billion in revenue. Analysts surveyed by Thomson Reuters expected the company to post earnings of 45 cents a share on $32.2 billion in revenue. Shares rose 0.4% in after-hours trading. CNNMoney's David Goldman contributed reporting.